When Westfield Police Dept. released its annual report for 2018, overall crime decreased. However, fatal vehicle accidents rose from zero in 2017 to four in 2018. 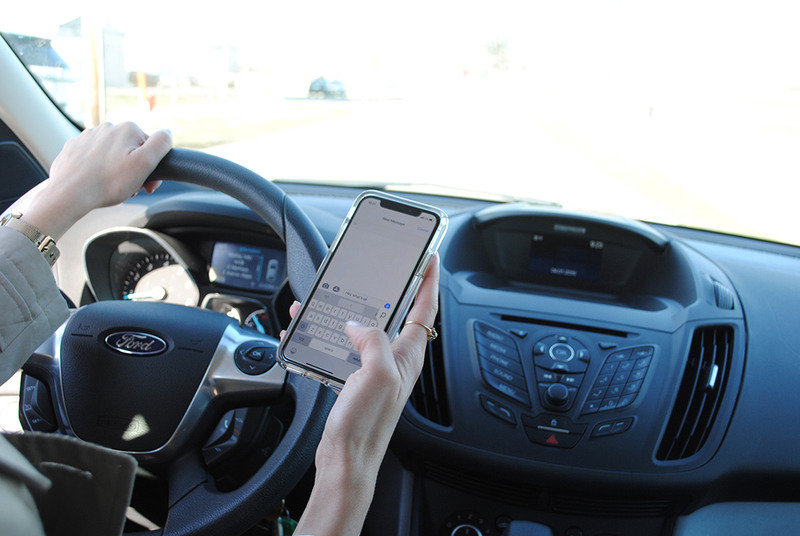 As a result, the city is zeroing in on the negative effects of distracted driving, such as texting or talking on the phone while behind the wheel. The city recently launched the SafeRoads Campaign, a four-pronged approach which Mayor Andy Cook hopes will lead to new legislation. Rush said the typical cause of an accident may be something like not yielding or following too closely, but the root problem is often drivers using their cellphone. But when an accident occurs, Rush said it’s extremely difficult to determine if phone usage was part of the problem when writing citations. Currently, among other limitations regarding cellphone use while, driving state law prohibits police officers from confiscating a device to prove a driver was using the phone. Rush echoed the call for enhancing distracted-driving legislation. The city launched its SafeRoads Campaign this month. April is National Distracted Driving Awareness Month. The four-pronged plan encompasses education, enforcement, environment and legislation. “Enforcement is us going out and citing people and stopping people and looking at those things that are symptoms of distracted driving, (such as) left of center, leaving the roadway, following too close,” Rush said. For the environmental portion, the city will make roads safer by adding signs and roadway markings or placing curbs to prevent drivers from turning left in high-accident areas. The leading cause of accidents in Westfield on Ind. 32 in 2018 was following too closely, a symptom of distracted driving. Other leading causes of accidents in 2018 included failure to yield and disregarding traffic signals, also symptoms of distracted driving. 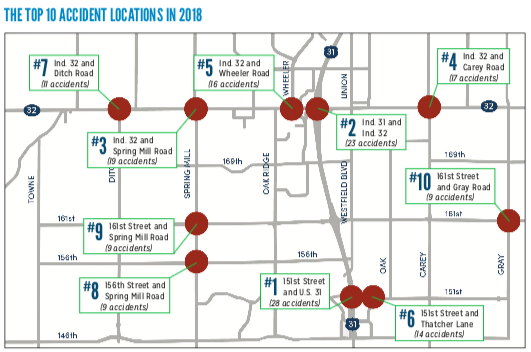 The top 10 accident locations in 2018 were: 151st Street and U.S. 31 (28 accidents); Ind. 31 and Ind. 32 (23); Ind. 32 and Spring Mill Road (19); Ind. 32 and Carey Road (17); Ind. 32 and Wheeler Road (16); 151st Street and Thatcher Lane (14); Ind. 32 and Ditch Road (11); 156th Street and Spring Mill Road (nine); 161st Street and Spring Mill Road (nine); and 161st Street and Gray Road (nine). 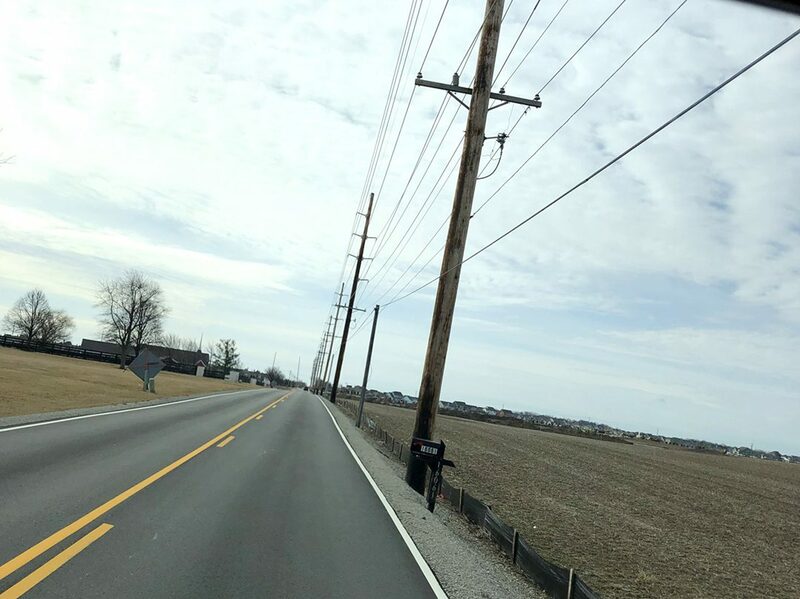 Besides distracted driving, Mayor Andy Cook has identified another problem to address: utility pole proximity to the roadway. A fatality occurred earlier this year when a driver slid off the road due to poor conditions and struck a utility pole 4 1/2 feet off the pavement. Cook has met with utilities to discuss the risk utility poles pose to drivers. Next Article Column: What does running at-large mean?